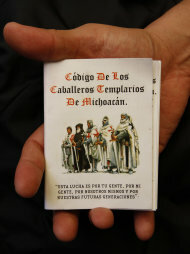 MORELIA, Mexico (AP) â€” An organized crime group calling itself the Knights Templar is distributing booklets saying it is fighting a war against poverty, tyranny and injustice, publicly appealing to hearts and minds in a part of Mexico where the government claims it has largely taken down the major drug traffickers. Federal police said they seized copies of the cartel's "code of conduct" booklet during an arrest of cartel members in the western state of Michoacan last week, but refused to release its contents Tuesday, saying they didn't want fan the flames of the quasi-religious movement. But a copy of the 22-page "The Code of the Knights Templar of Michoacan," illustrated with knights on horseback bearing lances and crosses, was obtained by The Associated Press this week. It says the group "will begin a challenging ideological battle to defend the values of a society based on ethics." The Knights Templar have been blamed for murders, extortion, drug trafficking and attacks on police. Analysts say the propaganda is part of an effort to transform a drug cartel into a social movement, along the lines of what right-wing paramilitary groups did in Colombia in the 1990s against leftist rebels â€” a fight in which both sides used the drug trade to finance their causes.